It is back to freezing temperatures in Chicago and today it is snowing all day. Barely went out of the house this weekend. Naturally, I was able to do one of the things that makes me happy, I wore my favorite and most comfortable leggings (they’re only $12!) and its matching pullover (it has thumbholes!!). What were you guys up to this weekend? With the temperatures back to freezing, and I don’t see it getting warmer any time soon, it can be so difficult to look chic all bundled up. I know for me, I usually look like a walking marshmallow. I have on my long puffer coat, beanie hat, heavy duty snow boots, and scarf all wrapped up around me with my eyes only peeking through. I may be warm, but it is not the cutest look. 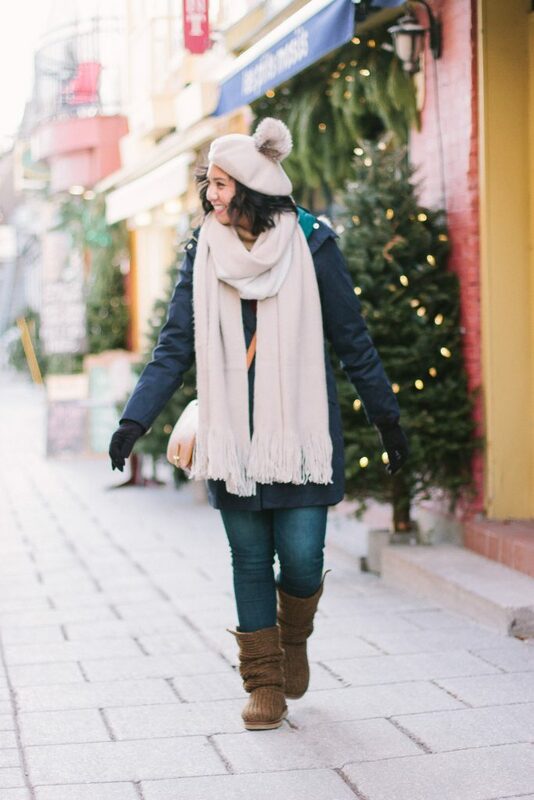 It wasn’t until we went to Quebec City that I realized there is a way to look chic while bundled up for Winter. You don’t have to sacrifice your warmth to look cute. Oh gosh, my freshmen college days just popped in my head. My friends and I thought it was so not cute to wear a coat when going out. Yes, even in freezing temperatures. That was dumb. Every time I see a hat with pom poms on it (especially the faux fur ones! ), I just think it is the cutest thing ever. The pom pom just makes wearing hats look fun and gives it more personality. If you can find a trendy hat to keep you warm, that is a bonus! I found my exact pom pom beret in Quebec City, but I found several other places that have them too. 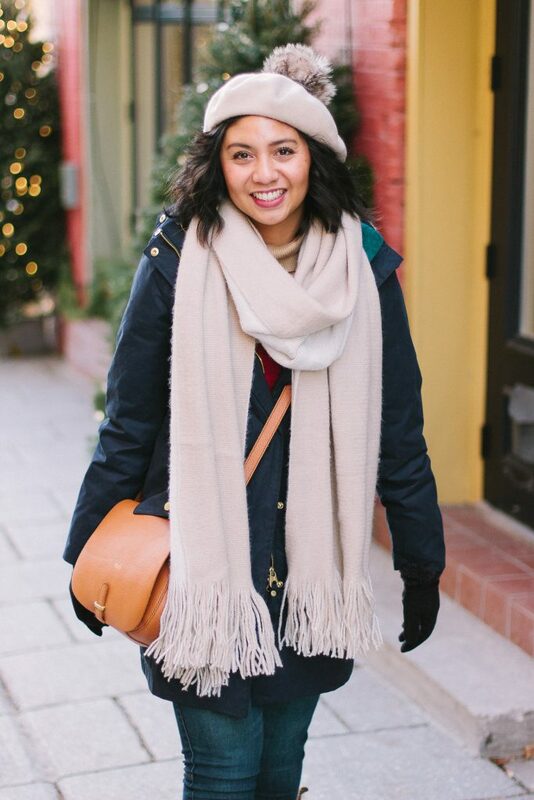 I love how the beret is trendy, still kept me warm, and the pom pom just makes it so chic! The look of an oversized scarf is one of my favorite winter accessories. Anything oversized can make an outfit look chic. Every time I wear an oversized scarf it easily elevates my winter outfit. Plus, the oversized style makes it sooooo warm! Believe it or not, finding a winter coat that fits your body makes a difference. It just makes it look more tailored. It doesn’t have to be fitted, just has to be proportional to your body type. The coat I am wearing in this photo is a 3-in-1 parka made for the Arctic. It is heavy duty, but since it is the right size for me, it makes me look a little more put together. 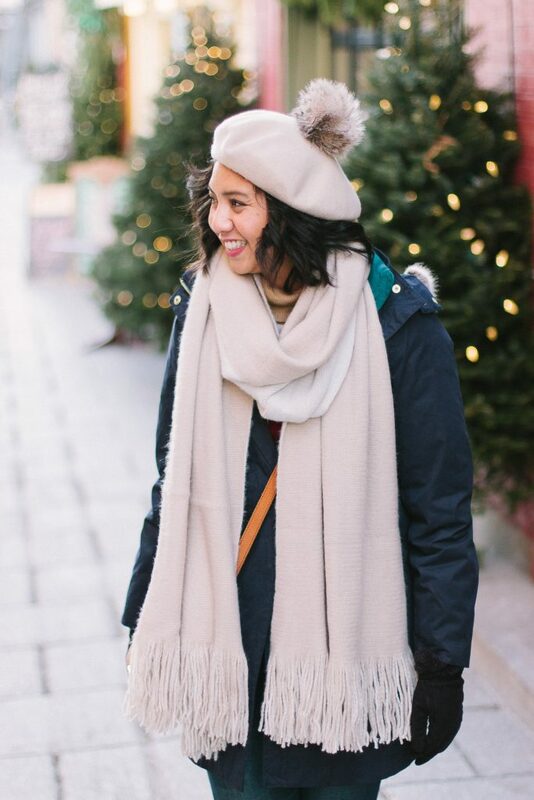 A little coordination with your winter hat, scarf, and gloves can make all the difference with your outdoor winter outfit. You can coordinate by patterns, prints, or color. In this instance, I coordinated by color. 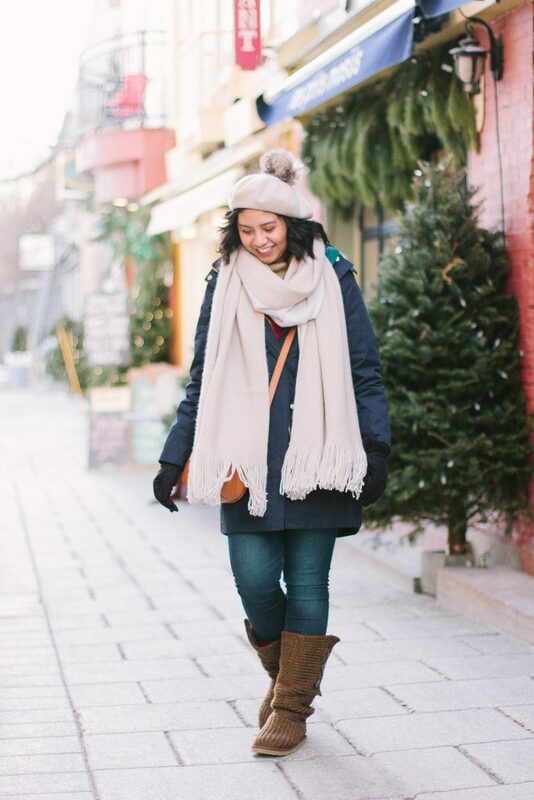 These are my tips on how to look chic while bundled up for Winter. Do you all have any additional tips on how stay warm without losing style? Happy MLK day to you all! Okay the pom pom beret is the cutest thing!! Love that you still look cute even in the freezing temps! I need to get a Pom Pom hat!! When we were in New York I definitely sacrificed fashion for warmth 🙂 Need to keep this in mind! Oh no!! I hope you had a coat on at least! These are really good ideas. I love the classic pom pom hat. 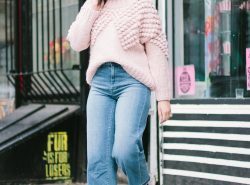 I can’t imagine going out sans coat in the winter – that is just crazy! I love having a large collection of coats to choose from, and I really love my faux fur! I always feel warm and chic when I wear it. Right?! Too cold! I’ve been wanting to get a faux fur coat! Gosh I hear ya! Its definitely hard dressing up in winter for warmth AND cuteness! You succeed with brio though! Right? The struggle is real haha! Thank you Didier! I haven’t seen too many hats like that before! So unique. 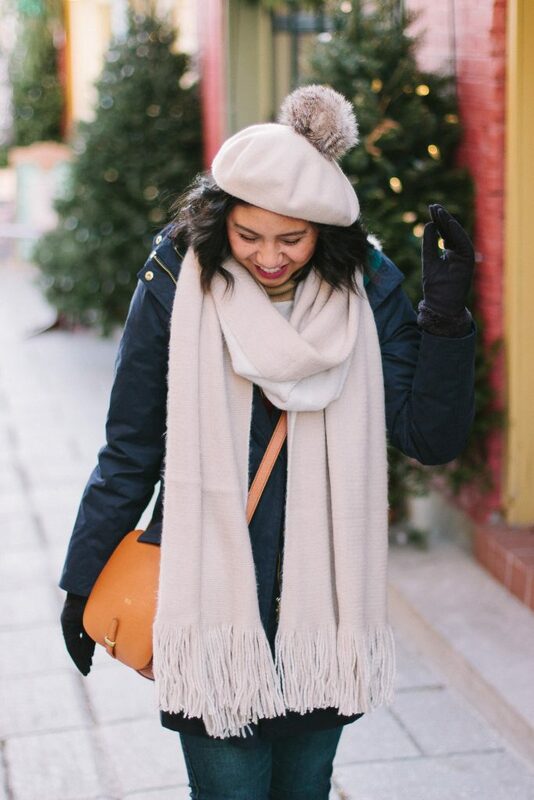 A combination of a beret, and a pretty pom pom beanie. Stay warm! You got all the right stuff. Your coordination is wonderful. Loving how you styled your beret and the pom poms on it. This is such a cute winter outfit! I love that scarf! That is a great tip! Thanks Marie for sharing! Amazing tips I love it! especially for now! I love your hat so much – so stylish! You have mastered winter-chic! I’m LOVING that beret!! You are lucky that you moved out of the cold! Such awesome tips for winter, thanks for sharing girl! Pom pom hats are the cutest. It will definitely make you look chic. I love this outfit of yours. Such a cute post and love your hat! You do this so well! I think fun accessories and outerwear are key! I like the idea of layering with a vest! I will keep that in mind! 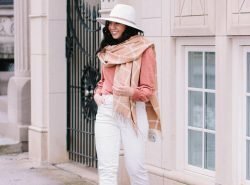 Love your hat and these are all such great tips! Omg if only I read this post before going to college today. ANYWAY you look so chic rach. loving that scarf! super fab look! Oo your hat sounds so cute! Thanks Kim! Such great tips, thanks for sharing!! You look so cute!! 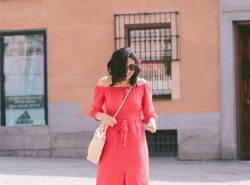 Un look muy boonito! Kisses! 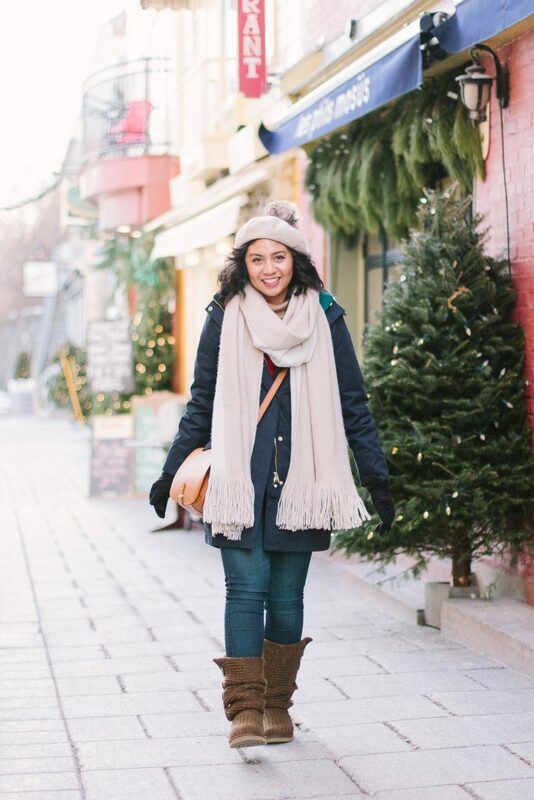 I’m all about layering and you are just the cutest in your winter gear! I love how you layered, Rach! It looks so adorable – which is always tough when you’re cold and shivering! Thank you Jessica! It really is hard haha!